On October 1, Teardrop Hotels opens its doors to Goatfell - the first of three former tea planters’ bungalows currently being restored by the group in Sri Lanka’s hill country. These openings are set to complement Camellia Hills, a newly built bungalow which opened in 2017, and collectively transform the tea country scene. Strategically located in close proximity to Hatton, Kandy, Nuwara Eliya and Ella, guests will be able to hop between the bungalows and immerse themselves in their history and surrounds. In a region where there is a clear divide between modern and heritage hotels, the interiors of each bungalow will offer a gamechanging difference, as Teardrop Hotels endeavor to bring real homes to life – and at a smart-but-accessible price-point. Nine Skies, near the hippy hangout of Ella, is built on a grander scale (as befits a director’s bungalow) and best approached by train. The Yakada Yaka or ‘Iron Devil’ has graced the mountains of Sri Lanka since the 1800s, transporting tea and people between Colombo and the hill stations. On arrival, guests are picked up from the station and transferred via tuk-tuk just a few minutes along the tea lined estate roads from Demodera Railway Station to Nine Skies. Its name is a nod to the nine-arch viaduct, through which it is possible to see ‘nine skies’ when looking up through the arches. The renovated five bedroom hotel is set within several acres of private gardens, featuring a croquet lawn, swimming pool and sun deck, with wonderful views across the valley to the working tea factory and famous Demodera loop. Dating back to the colonial era, the bungalow epitomises its legacy, yet discerning guests will feel right at home with contemporary facilities and high-end personalised service from butlers, gourmet dining and with stunning views across the valley and famous Demodera Loop from the garden pool. 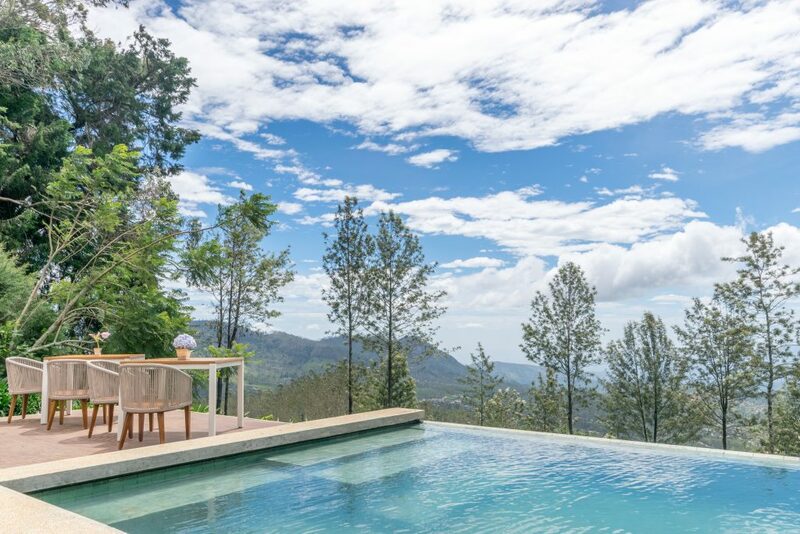 The final Teardrop property due to open in 2019 is Pekoe House, located just 45-60 minutes from the tropical surrounds of Kandy. Set amidst the stunning tea estates to the north east, within reach (and view) of the Knuckles Mountain Range, Pekoe House will have six double bedrooms, a swimming pool, croquet lawn, and living/dining space, as well as excellent food. Activities will include tea factory tours and trekking in the Hunas mountains, observing lush green tea plantations, waterfall vists and jungle treks to spot endemic wildlife such as the White Sambhur and Barking Deer. One of Sri Lanka’s hottest new openings, Camellia Hills is situated just a short distance from Dickoya on the Castlereagh Reservoir – a mesmerising lake surrounded by tea plantations. The newly built bungalow has just five individual bedrooms – two Camellia Bedrooms and three Lakeview Bedrooms which boast some of the best views in the hill country from private garden terraces. While Dickoya’s two interconnecting rooms are ideal for families, the secluded Warleigh room is a highlight for couples, opening directly onto the lawn through three sets of French windows. Bedrooms are usually booked individually, however the bungalow can also be taken on an exclusive-use basis for groups and families. For guests wishing to relax and unwind, the swimming pool and ambalama are located in the front garden, surrounded by tea fields, taking full advantage of the inspiring panorama across the reservoir. Butlers are poised to pamper guests and dining here is relaxed, personalised and atmospheric. The views take centre stage too; offering guests sundowners beside the crackling fireplace or delicious contemporary dishes overlooking the tea fields. Activities outside of the hotel include: trekking along tea factory trails, forest picnics, white-water rafting and island hopping via boat. One of the best ways to travel to Camellia Hills is via train to Hatton, a busy provincial town with a lively local market. Alternatively, guests can arrive in just 30 minutes from Colombo via seaplane, landing on Castlereagh Reservoir and will then be transported up to the bungalow along the tea-lined roads.